Thought Experiments - DetroitEliminate The Muda! « Are You Married To A Gambler? Einstein was famous for many things including the theories of general and special relativity. I also learned that he was known for using a technique to dream up the answers to his questions of the universe, called “Thought Experiments.” This series takes the concept of thought experiments to different places. Today’s thought experiment is Detroit! One of the epiphanies I have had while delving into the world of personal finance is that retirement is not a single number. Most of us are use to those ING commercials where everyone is walking around with “their number.” Most personal finance pundits will refer to planning for the future and estimating your financial needs with wide selection of retirement calculators for you to choose from. Retirement is really a flexible target, there is not just one number for any of us. We actually each have a range. On the upper end of the scale you can easily buy the house of your dreams, travel on a whim and eat lavish meals at fancy restaurants. On the other end of the scale you will live a modest retirement at best or possibly need to supplement your income with a part-time job. This blog post was featured in the Festival of Frugality at Penniless Parent. Please check out this link for other great articles! Retirement can come a lot sooner than many would think. Of course to get there may require what some might consider “extreme” measures. Jacob from Early Retirement Extreme has shown that if you are determined, you don’t have to have a lot of money, you just have to lower your consumption. This chart is based on data provided by the New York Times graphic titled How Do People Spend Their Money. While many writers will highlight the best places to retire cheap, for this experiment I want to focus on how to get there faster. To do so we either need to increase income or decrease our expenses. 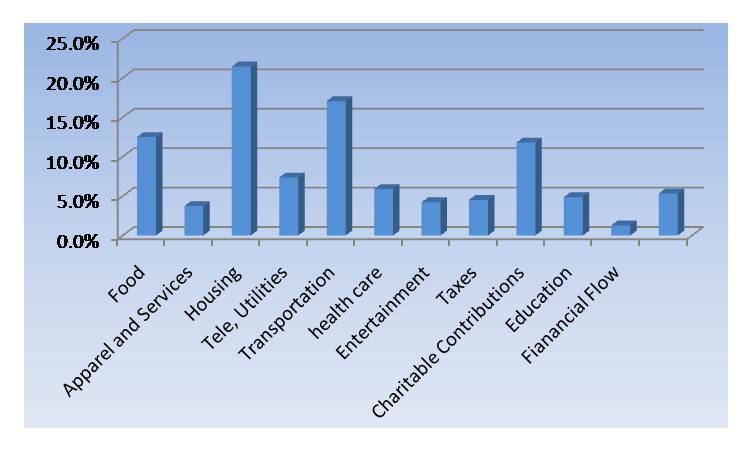 Looking at the chart the obvious opportunities are to decrease housing and transportation. In a rare moment of spontaneity, while taking out the trash with my wife, I shared with her my desire to sell out and move to Detroit. She nearly tripped over her own two feet as she lost her balance due to the unexpected announcement. Once she recovered she concluded that this must be a joke. But consider this for just a moment. Assume that you have worked hard to eliminate your debt and you have begun to accumulate a decent nest egg. Could you move up retirement if you were to move to a place such as Detroit? Virtually every housing market in the country is in better shape than Detroit at the moment. The picture above is a listing that I found today! Houses are still selling for less than the price of a new car. If you “retired” and pay cash for a house in Detroit you will already have nearly 22% of your expenses behind you. With no debt and no mortgage, how much money do you really need to live? This of course is there the thought experiment gets very personal. If you can only be happy in life with champagne and caviar and need lots of sunshine and warmth you may not be ready for Detroit. Do you enjoy lazy days at home in front of fire while watching your neighbors shovel snow. If a great day to you is spending the afternoon at the library reading, then Detroit is waiting for you. Theoretically, with maybe the occasional side job, the wife and I concluded we could probably afford to retire in Detroit, but it is Detroit. No offense to all our hard-working motor city citizens but personally, I do need the sun and warmth. If we could only move Detroit further south! This exercise does make me reconsider my vision for retirement. How much am I willing to compromise to achieve financial freedom sooner? Detroit may not be right for you either but hopefully you do realize that retirement is a function of income, assets and expenses. The lower your expenses (both today and in the future) the quicker you can achieve your retirement. I can only imagine your wife’s reaction. I am not sure where I want to retire, so my ‘retirement’ is still a safe number of $1.5-2 mil. I have a long ways to go, but have no doubt I will reach a sizable number. Now off to work I go! .-= Money Funk´s last blog ..Private School: Worth Your Money? =-. .-= Mrs. Money´s last blog ..What is Quinoa? =-. 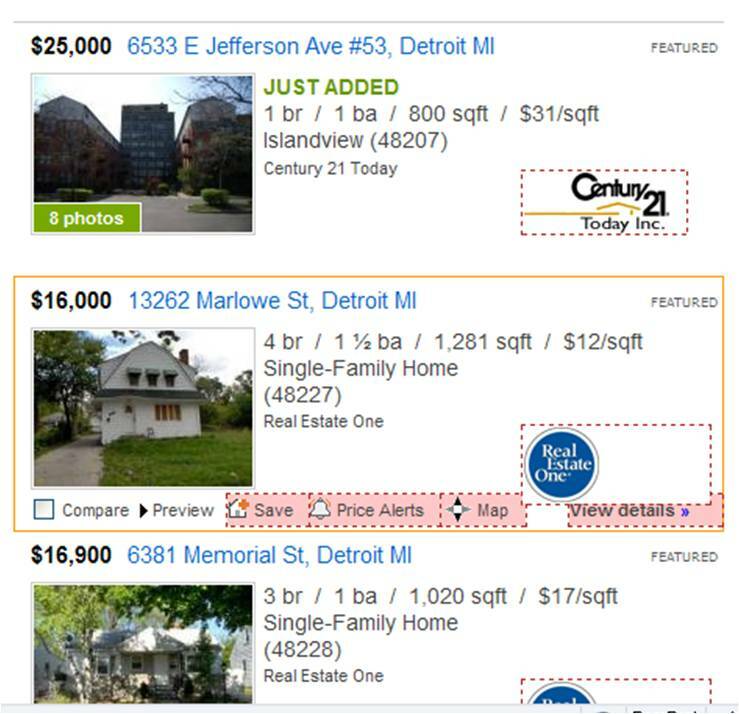 Detroit housing prices are ridiculously low! I thought I heard somewhere that the old Kingdome sold for around $500k. Wha? I’ve also heard houses going for $5k? Too bad you can’t pick up the home and move it to NYC! We need a target retirement number to get us started but you’re right, its fluid. We need to keep going back to it to see if its still a target that’s right for us. And you also realize that we pay premiums for certain aspects of our daily lives and retirement such as where we want to live. .-= Craig/FFB´s last blog ..We’re Buying A House! =-. @MoneyFunk – How is Cali doing these days? We sold about 4 months after the top. It was amazing how quickly we lost $25,000+ as prices plummeted. @Mrs. Money – Maybe if you move to Detroit first, you could retire? Then its an easy drive, or bus ride from your family. I dug a little deeper in the pricing and it is very volatile. I live across the river from Detroit in Windsor, Ontario (Canada). Detroit isn’t a great reason to live here. Some of the concerts and so forth are great. Joe Louis Arena is a bit of a mecca to rock fans like us. (My husband and son saw Rush there.) But to live there? I don’t think so. There’s a reason those houses are so cheap! .-= 2 Cents @ Balance Junkie´s last blog ..Shareholders vs. Stakeholders: Skipping Steps Is Costly =-. We posted in October (http://controlyourcash.com/index.php/real-estate/78-renting-is-for-mental-patients.html)about this house in Detroit that was listed for $20. I’m sure it’s sold by now…or not. As 2 Cents is quick to point out you actually have to live in Detroit which isn’t as much fun as it sounds. Speaking of Detroit, if you don’t mind third-world trappings check out Bali. My girlfriend is retiring there. The cost of living is wicked cheap and I hear the weather’s pretty nice. Interesting article. I have been thinking, is this a great time to invest in a house in Detroit? I feel like the price can only go up. What’s so amazing about those prices is that they are below the replacement cost. This isn’t just a depreciation from an inflated value, but you could probably buy those houses, strip out all the material, and resell it for more than you paid. .-= FinEngr´s last blog ..Does This iPhone Come With or Without Cancer? =-. Wow thats crazy FinEngr. I’m sure there are some people out there really taking advantage of Detroit’s current economic plight. .-= MFO´s last blog ..Yakezie Link Rally =-. @MFO – It makes you think! No doubt someone will find a way to profit from it. @FinEngr – It makes you wonder if it would be profitable to buy houses for scrap, transport and resell everything possible? 1.) Buy raw land in more desirable locales. 2.) Buy the houses in Detroit by the block. 3.) Move houses from Detroit to raw land. 4.) Sell blocks of Detroit land to developers. 5.) Sell old houses in new locales as green developments. @FinEngr – That rocks, you even get the green stamp of approval for the recycling of the materials! You are the man! Living cost is just one dimension of retirement lifestyle but the one has been talked the most. I’ve been thinking about this for a few weeks and you commented the same issue you face on my post. It would be interesting to see if your wife would compromise and agree to move interstate or overseas(I’m guessing not in a million years? :)). What about mini-retirement? I wouldn’t want to live in the same place for 30 years either. @Betty: a lot of retirees from Australia find their home in Bali too. It’s beautiful and you can rent a decent house for less than $200/month (not in a touristy area and it would help a lot if a local negotiates the price for you). Lunch in a cafe will set you back $2 or less if you go to the traditional restaurant. With warm weather, mountains, beaches and modern facilities accessible for you, who wouldn’t be tempted? .-= Bytta @151 Days Off´s last blog ..Day 30: Our Father 2.0 =-. @Bytta – You’re making Bali sound better and better. My wife says you’re right about here too, she is not moving out of the states. We will eventually move to another state though. Neither of us are interested in retiring in Georgia. Most places where housing is extremely cheap–such as Detroit–are extremely cheap because the quality of life is extremely poor. Only a thug can survive in such places; do you want to be afraid to be in your own home? And Fireman, physically moving a house is very costly.